Musical Ditties for January - The best of the rest. Here's a few more tunes I pulled down from eMusic in-between my Zappa-fest. Deke Leonard - Before Your Very Eyes: - "World Exploded in My Face" and "Map of India". This album was produced back in 1980 while Deke was in/out of Man. Features Nick Lowe, Dave Edmunds, Terry Williams and Martin Ace. It's a Beautiful Day - Live in Seattle: "Girl with No Eyes", "White Bird", "Hot Summer Day", "Time Is". Normally I dislike live versions of studio songs but they did a great job here. Alan Gowen: Before a Word is Said - "Umbrellas" and "Fourfold". This takes me back to my days as a Fresh Air DJ on WKSU-FM. Alan played in two British/Canterbury bands Gilgamesh and National Health. This solo effort, recorded a few weeks before his death, lets Alan do his thing without the struggles of working within a band. John Wetton: Battle Lines - "Walking on Air" and "Battle Lines". These two tracks by ex-King Crimson and Asia singer-songwriter-bassist remind me the most of his work with Asia. Ike and Tina Turner: "Proud Mary" and "Rock Me Baby". Two of the best R&B tracks ever. Raw, soulful, powerful. Derek Trucks Band: "Mr. P.C. ", "555 Lake", "Naima", "So What" and "Footprints". Derek is the son of "Butch" Trucks of Allman Brothers Band fame. Derek plays guitar on this debut album that portrays not only his Southern rock roots but also has tributes to John Coltrane and Miles Davis. My favorite part of these tracks is the window-rattling bottom end. They made my BassBombs playlist on my iPod. Musical Ditties for January - Zappa fits all! After racking up over 100 tunes last month from eMusic (22 cents a track!) I eagerly awaited for my subscription to start again in January. I have the 65 tracks a month plan which is just about right or at at least I thought so. To my surprise and delight the entire collection of Frank Zappa and the Mothers of Invention was released exclusively to eMusic in January. Say what you want about Zappa he was a rare musical genius. In some ways his career mimics Miles Davis. Miles went through many phases as he consistently explored different genres. There was Miles playing bop, blues, funk, fusion. Same with Zappa. There was Zappa playing sixties pop, social-satirical rock, jazz, jazz-rock fusion, orchestral, live theatrical rock, guitar jams. He, like Miles, was always exploring, never content with a successful sound and staying with it, milking it for all its worth. No, not these innovators. In some ways this was to the detriment of their careers as some of the roads they took became dead-ends. I think Zappa always saw his work as a parody of the sound he was presenting. Everything had a tinge of sarcasm to it. Maybe Zappa's career was actually his own staging of a black comedy about the supericial music world he lived in. His lyrics,--satirical, perverse and biting, were there to tweak the noses and ruffle the feathers of the censorship crowds. If he could only see the corporate music world of today! Hot Rats: Gumbo Variations (Don "Sugarcane" Harris on violin), "Peaches 'n' Regalia"
Freak Out: "Help, I'm a Rock" (somewhat Kafka-esque but lots of fun). One Size Fits All: "Sofa No.1" ("Saturday Nite Live" theme), "Po-jama People", "Inca Roads". Most of the vocals are by George Duke. Waka/Jawaka: "Big Swifty". Big band-type jazz instrumentals. Grand Wazoo: "Blessed Relief". Big band-type jazz instrumentals. These two albums are "sister" recordings with the same explorations in mind. Today you'll hear jazz combos playing these tracks. Apostrophe': "St. Alphonso's Pancake Breakfast", "Uncle Remus" (with George Duke), Father O'Blivion. Over-nite Sensation: "I'm the Slime"
Absolutely Free: "Call Any Vegetable", "Plastic People"
Roxy and Elsewhere: "Be-Bop Tango"
I was never a fan of Zappa's lyrics when he ventured into the raunchy areas but I loved his satire. Though it delved into Los Angeles weirdness and kinkiness of the 60's and 70's I think his mission was to stick it to the censors. He capped it off with his hit single "I'm the Slime from the Radio". Today, his lyrics wouldn't lift an eye compared to the loathsome words of today's rapper's. Zappa will still be enjoyed by many, and his repetoire re-presented by today's musicians, but be careful as you explore. You may get offended along the way. I think that's just how Zappa wanted it. Cleveland was cold. Tampa was warm. At least it was to me. Many folks in Florida think sixty degree weather is freezing. Only "snowbirds", the term for the thousands of Ohioians who flock to Florida in the winter, are jumping with joy when the thermometer hits sixty degrees. Yobr City is an old community near Tampa. Many of streets have buildings from the 1920's. They built this new shopping plaza as a hub in the middle of the city. It works well with lots of outdoor plazas, restaurants, shops and walkways. These yellow street cars run in a long loop around the Ybor. They match the motif of a 1920's Latino shopping district. These "bar stoolies" think it's cold today. The food here stinks. It probably would taste better to someone completely "tanked" from the margaritas. Beer and bucks on the wall. The whole place is filled with dollar bills stuck to the walls, ceilings and archways. Each bill has a message or love wish written on it. There's probably $1,000 stuck to the walls here. Mike and Jane have no complaints. The view is great and so was the breeze. The shopping plaza spreads over three blocks. There is a Latino motif throughout as the neighborhood is mostly Hispanic. Lots of nice shops with Latino gifts. No comment except I don't know where this is going. This scene reminds of French Quarter in New Orleans. It's photo safari time again. I'm in Ybor City with Mike and Jane from the office. They were in the car with cell phones on a conference call (see photo below). To relieve my boredom I spotted an alley next to a restaurant. Alleys are treasure troves for photographers. You can always find interesting things to shoot in an alley. The older the alley the better. The name on the vent says Nutone. They make ventilation systems and it looks like they been around a long time. This vent and the wall look like they've had a few paint jobs over the years. It's interesting how man-made artifacts, when neglected, get taken over by nature. It all becomes part of the same ecology. Nature weathers artifacts away. Then shrubs grow in the most inane places. Nature just incorporates it back into itself. I'm just guessing how these holes were made. Bullets? Rocks? Baseball bat? Interesting integration of artifact with street artistry. I normally dislike resorts. They're beautiful but all its beauty is man-made. Saddlebrook may be an exception. Saddlebrook is a beautiful resort. It's peaceful and serene with well thought-out landscaping that includes the former swamps it was built upon. It's not often you can go golfing with gators. I wonder if they've ever eaten a golf ball thinking it was an egg? This one ran away from me. Must be shy. The gators come out in the afternoons to sun then they slithered back into the pond at night to sleep. This beautiful crane stuck around long enough for a picture. But not for long. Maybe it's my feet? Birds have great ability to smell. This is the foot bridge. The trees had shed their foliage for the winter. You can see many abandoned bird nests at the tops. This is the pond under the foot bridge. This was a tough shot because of all the light slicing through. Wrecked havoc on my light meter. This is where Saddlebrook does a nice job of landscaping between the natural and artificial areas. The sun came out, the moon went down, the snow stopped falling and my camera went-a-clicking. Today's photo safari starts at the the headwaters of the Chagrin River along Geauga Lake Rd. in Bainbridge Township. Once I spotted my quarry, a favorite bridge, I leaped from my car right into a knee-deep snow bank. Mary watched from the car with delight as I sank in the snow and in hopes that I'll fall into the icy river. But I disappointed her again and crept through the bank to get my shots. Here you can see the new bridge and the stone work from the original bridge. My children and I used to walk down to this bridge from our house and sit on top of the stone wall to watch the river (of course, not in the snow). It's beautiful here in the summer and fall. This is the drive to an old farm. Covered with snow is a stone fence which leads up the road. Another shot with a wider lens. Same road with me just working the camera angles. This is one of the most peaceful and scenic side roads in Bainbridge. The blue sky really pops on this one as compared to the sky on the bridge. The difference comes from the sun's position. In this case the sun is to the left while in the bridge scene and the first parking lot it is behind me. Again, nice saturation on the blue sky. It's just cold here. So now we switch to parking lots. Why not? It's all about winter anyway and isn't it fun to slog a shopping cart through a snowy parking lot!?! I left the aperture open too much here so it's a bit washed out. I sure hope you like these lovely parking lot pictures as much as me (sic). Actually I put these up so my father-in-law, who now lives in Florida, will see them and laugh. Eat your heart out Trevor! I give up. Ten more inches of snow today. Let's see if we can capture snow in flight with the camera. That's all I'll be shooting around here anyway so I may as well get good at it. This is our snowy house. When I was done Mary had locked me out. I'm going to Tampa next week! I picked up Photography Monthly magazine at Borders with the cover article entitled, "Winter Landscapes: 23-page Essential Photo Guide". Now I'm getting inspired! Just need snowshoes. This overcast and dreary Northeast Ohio weather has made it hard for me to get out and shoot picts. Saturday was the first day the sun broke through for the whole day. The best times to shoot are in the early morning and the late afternoon/early evening. These are my first shots with the Canon 20D. I spotted the green grass color coming through a very thin layer of ice. The knarly tree trunk still had a patch of dried debris under it. It was a bit reddish, not brown, in its color. Can you see the dog checking me out in the background? I used the RAW format instead of JPG when shooting. This allows me to process the image before taking it to TIFF then to JPG. I slightly brightened this shot but left the coloring untouched. This was not a great job from a technical standpoint. The snow was falling in heavy clumps. I couldn't shoot at a faster shutter speed than 1/60 while hand-holding a 200mm lens. The snowfall added noise and a few blotches which I decided not to cleanup. This is the Chagrin River, and while it has some great floods, the dreary light and winter scene made it hard to get anything dazzling out of it. But there will be more floods here and I'll try again in the spring. These magnificent birch trees had a perfect "glistening" look to them. It's nice to be able to take snow picts without the snow turning blue all the time. The 20D, like most modern digital cameras, comes with built-in "white balancing" technology. Now I'm working the flash on the 20D. Here's a shot of two Paul's, Wehrmeister and Fresty, taken at the Rev. Dr. Martin Luther King Jr. Breakfast held at the Marriott Downtown Cleveland. The flash did a nice job on the two main subjects but since it was a direct flash from the built-in flash unit, you can see little white dots on all the water glasses in the background. O.K. should you let a kid drink Mountain Dew? This is my nephew, Paul, and no, it's not a good idea. See what I mean? No more Dew for you! Because the table had a glass cover the flash bounced off of it and laid the brown blotch across his shirt. A few of the shots showed brown blotches across his face. As things brighten up around town you'll see better stuff from me. Check back again! Cleveland Indians logo is the feature character for "cool" snack food. My son works in Shanghai and he came across this bag of chips at a grocery store. Yes, it's Chief Wahoo sans the feather, and, yes, this is a flagrant theft of trademark (unless the Indians are licensing the logo to the chip manufacturer). In China the "fine" for using someone's trademark is about $500. That's not much to stop them from doing it again. If you are an American brand it is difficult to get anyone to "cease and desist" from using your trademark. When I traveled to China in 2003 there is a popular place in Shanghai called the "Everything Market." It is an outdoor marketplace with hundreds of eight-foot wide booths selling every type of counterfeit branded goods from Ray-ban sunglasses to Burberry purses. There must be 50 booths selling fake North Face coats. At the Great Wall we got a big laugh seeing all the American tourists wearing brand new North Face clothing. We all know the power of trademarks. But what does a trademark mean in another culture? In the U.S. the Cleveland Indians Chief Wahoo is well-known, even reviled, as a sports logo, but did anyone ever think it would represent "coolness" in order to sell potato chips? By the way the chips are a tomato flavor. Yuck! East Cleveland 1966: Where did everyone go? 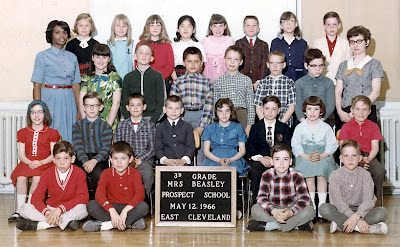 This is my third grade class photo from Prospect Elementary School in East Cleveland, OH. I often wonder what happened to all my classmates. I have not seen any of them, save one, since moving to Cleveland Heights in 1970. I have listed their names below as can best be recalled. Front row: Ronald Ractko, John Nagy, Charles Seaman, Zack Williams. East Cleveland was a wonderful little community at the time. We all walked to school and also walked back home for lunch! There was a great place to play called Forest Hills Park. It used to be the summer estate of John D. Rockefeller. He played golf there 100 years ago. We played everything from baseball to army-man to sledding to hide-and-seek to ice skating. We lived that park. Another great place was Shaw Pool off of Hayden Road. Everyone learned to swim there. It had ball fields, tennis courts and the greatest playground. I lived on Rosemont Rd. which was between Kirk Junior High on Terrace Rd. and Euclid Ave. My mom told us that Rosemont Rd. was the drive to Rockefeller's estate and that his workers built their houses on that street in order to be close to the boss. All the houses were close together and every street was packed full of families and friends. There were some families with over 10 kids in one house like the Hastings who lived at the corner of our street. Tom Brazitis, the Plain Dealer reporter and Washington correspondent, lived at the opposite corner. At the time he was editor of The East Cleveland Leader. He had a big circular backyard with a fence that edged the outskirts of the three streets along his property. It was always full of weeds and wild plants. We used to take people on tours of his "backyard jungle". Everyone had friends there. My friends from class were Chris Mates, John Nagy and Ron Hansen. My class nemesis was Donna Van Pelt (she always topped me on tests and grades). My friends from my neighborhood were David and Jimmy Fielding, Mark Drefs, Steven Wild, David Chamberlain and Stanley Anthory. Everyone knew everyone too. We used to go to the fire station and sit on the trucks or go into the police station and ask the officers to lock us up in the jail. A train track split through the city so that meant putting pennies on the track in order to have the trains flatten them. There was a YMCA on Lee Rd. We went there on Saturdays during the winter to swim and play pool. Many of us were in Indian Guides. There was a Mr. Donuts on Euclid Ave. in East Cleveland. It had a big picture window so you could watch the baker make the donuts right in front of you. The baker loved it when we watched him especially when he was cutting the doughnuts from the sheet of dough. He would flip each cut-out onto his thumb and then, at just the right moment, he would toss one of the cutout holes at the window in order to startle us. My dad used to give us a dollar Sunday morning to buy a dozen "day-old" donuts. They were the best. East Cleveland in the sixties was a time of great innocence for many. We knew nothing of Vietnam, hippies, or race riots. But we had to grow up quickly. Within a few years things changed dramatically and East Cleveland was never the same again. So where did everyone go? If you are from East Cleveland in the 1960's please leave your recollections in the Comments section below. P.S. It may take some time for this blog to be indexed by the search engines in order for people to find it. So even if this post has been up awhile you may be one of the first East Clevelanders to see it. For pictures of Forest Hills Park click here and of East Cleveland click here. There is pretty cool museum in Baltimore called the American Visonary Art Museum. The building is at the end of the Inner Harbor. The artist, Devon Smith, is a kind of quirky fellow who lives in a trailer in the Pennsylvania hills and scavages junkyards for parts for his "robots." the one above is named "Sun". It's hard not to love these things. Just like family. Everyone likes to pet "Pluto". Isn't she a pretty hot-looking date? Her name is Saturn. Sorry, but Saturn is married to Sun. All of the robots have lights in them and some of them move around. Are Devon's robots starring in a movie!?! Check out these screen-savers offered by 20th Century Fox. There's a new movie called Robots: Repair for Adventure. The three main characters are Rodney, Fender and Piper. It looks like the animators may have gotten their inspiration from Devon. I hope he's coming to see it.